Digital recording technology was changing and becoming cheaper at a frantic rate in the early '90s, rendering many products obsolete overnight. The DM80, at around £10,000 for a fully equipped system, was a third the price of many existing systems of a similar spec. Just four years later, Roland's own similarly equipped VS880 cost less than a sixth that of the DM80. The recession of the early '90s was difficult for many companies, but not Roland. Diversifying still further from their roots as a maker of synthesizers and organs, they emerged stronger, encompassing almost every area of hi-tech musical instrument manufacture. In the first three parts of this history, I described how Roland emerged from Ace Electronics and Hammond International in 1972, and grew in just two decades to be one of the leading hi-tech music manufacturers in the world. In this part, we'll see how the company sidestepped a dramatic slowdown in the MI industry, and evolved into a corporation very different from the maker of analogue synths and organ rhythm accompaniment boxes it had been in the early '70s. MA7 & MA20 micro monitors. DS330 Dr Synth GM/GS synth module. DM80 multitrack disk recorder system. R8 MkII Human Rhythm Composer. Up until this point, there was a branch of digital music production that still lay beyond Roland's reach. This was multitrack hard disk recording which, long before Pro Tools and even cheaper computer-based systems, was still the domain of high-end systems such as the AMS Audiofile and the DAR Soundstation. But by 1992, the cost of random-access digital recording and signal processing was dropping rapidly. Hard disk recorders and editors had started the decade costing well in excess of £30,000, dropped below £20,000 in 1991, hit £10,000 in 1992 and carried on plummeting to the amazing prices that we enjoy today. Once prices started to collapse in 1991 or thereabouts, companies such as Akai, Korg and Roland decided that they wanted to get involved. Korg did so while prices were still in excess of £20,000, releasing a fully featured post-production system, whereas Roland waited a few more months, and released a considerably smaller and less powerful system aimed more at the music industry. The DM80 appeared in two flavours: a four-track version with a single 100MB drive, and an eight-track version with double the storage and a sample-rate converter on one of the digital inputs. There was also a software package for the Macintosh, Track Manager. In principle, this allowed you to cascade four system units for 32 channels of synchronised playback. The DM80 also offered a limited form of automation for its two-band EQs, level and pan controls. Unfortunately, the eight-track version was merely two four-track systems, with little interaction between them, and you were limited to just 128 'Takes' per system. 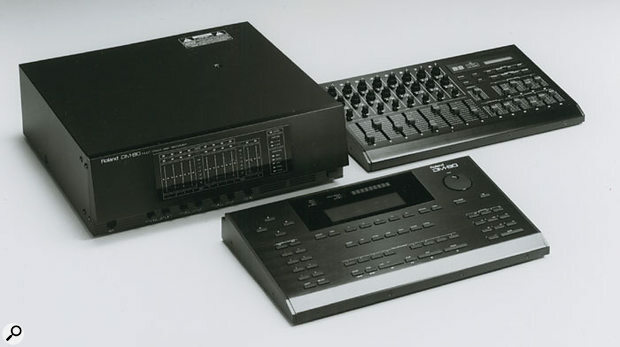 Furthermore, the DM80 offered no waveform display, limited crossfade facilities, slow and cumbersome menus, no video output for an external monitor, TRS jacks instead of XLR connectors, and was capable of storing just 18 track-minutes per system! Oh yes... and with insufficient storage for multiple projects, you had to back up everything via the SCSI ports provided on the back panel. Given these limitations, it's hardly surprising that the DM80 was not a commercial success. What's more, the UK retail price of £7455 for an eight-track recorder with just 200MB of storage (or nearly £10,000 if you purchased the essential DM80F fader unit and DM80R remote control options) quickly started to look hugely overpriced and under-specified. So why — with more than 90 hard disk recorders already on the market in 1992 — was the DM80 important? In itself, it wasn't, but this was the 'missing link' between Roland's 'S'-series samplers and the 'VS' recorders that form the backbone of the company's range in the 21st century. The JV80, the first of the massively successful JV synth range. Were it not for the DM80, the big news of 1992 might have been the replacement of the 'D' and 'U' series synths with a new family of synthesizers, modules and workstations. These were the 'JV' series, the first two of which were the JV80 and its little brother the JV30. Despite the similarity of their designations, these were very different synths. The JV80 was the 'pro' model, with a powerful, 28-voice engine that let you combine up to four unique tones for each voice. It sported a semi-weighted, pressure-sensitive keyboard, eight editing sliders, an external slot to take 2MB PCM Expansion Cards, another slot for a RAM card, an internal slot for one of Roland's new range of 8MB PCM Expansion Boards, and a competent set of master keyboard functions. Consequently, it was an immediate hit with Roland aficionados, and it proved to be a fine workhorse. Sure, it was not quite the workstation that many had anticipated but, as the first of the illustrious line of JV synths (see the box opposite), it deserves its place in history. Strangely, the company did launch a workstation in 1992, but it's largely lost to history, because, as they had with the W30 a couple of years before, Roland had again judged the market incorrectly. The JW50 was a good idea in principle, taking the 16-track sequencer technology from the MC50 Micro Composer, and adding 30 music styles derived from the MV30 'Studio M' Music Production System. Unfortunately, its sound source was a 24-voice 'one tone per patch' GS/GM (General MIDI) engine, which placed the JW50 firmly in the domestic, pub and karaoke class of keyboards, not the professional end of the industry. In retrospect, the JW50 was decent enough, with a large screen, the ability to edit and store user patches, a good selection of edit faders, and the ability to record and replay some surprisingly sophisticated sequences, but it failed to take the world by storm. The JV30, meanwhile, despite the JV name, was very much an entry-level synth. Another GM synth, it could produce only one tone per voice, and offered just 24 voices. It lost the semi-weighting and pressure-sensitivity of the JV80 keyboard, as well as all the other goodies mentioned above. Roland seemed to be finding no end of ways to repackage their GM engine. There were two more Sound Canvases released in 1992, two more 'CM' desktop music system (DTMS) products to replace the aging CM32s and CM64, a GM/GS sound card, and the SC7 sound module. More repackaging was evident in the SP700 Sample Player (which was, in essence, an S770 without the sampling capability, but with the ability — at last — to read Akai S1000 disks) and the DJ70 Sampling Workstation, which drew both its sampling and editing capabilities from the S770. These days, there are countless similar devices, but despite innovations such as the novel 'scratch wheel' controller, the DJ70 proved to be a little ahead of its time. Designed to make high-quality sampling straightforward for DJs, the DJ70 offered a number of innovations (not all of which, such as the 'scratch wheel', worked quite as well as hoped) but was rather limited in other areas: there was no built-in storage, and a maximum of just 4MB of RAM. Again, the idea was good, but the implementation was wide of the mark. So why does the DJ70 deserve anything other than a passing mention? Well, ask yourself — in these days of cheap, ubiquitous Grooveboxes — what was the first product to combine real-time sampling, real-time phrase sequencing, and a device that lets you 'scratch' samples? Yes... Roland had done it again, and foreseen the way the world was going. It's just that the DJ70 arrived a little too early to be technologically mature or cost-effective. Another idea that came just a little soon was that of the digital grand piano. The HP7700 was a beautiful instrument, with an excellent hammer action and a speaker system designed to imitate the soundfield generated by a 'real' grand. Nevertheless, this technology, too, was immature, and the idea would only come properly to fruition a few years later, when improved DSP power would make Roland's KR-series digital grand pianos a reality. The Boss DR660 was a popular 'starter' drum machine, and remained in the catalogue for over half a decade. Elsewhere, Boss were encroaching on traditional Roland territory, with the DR500 MkII and DR660 drum machines. Together with Roland's own R8 MkII and R70 Human Rhythm Composer, these were doing brisk business in the MIDI percussion markets. But the biggest news of 1992 was probably the demise of Roland's five-year-old PD11, PD21 and PD31 percussion system, and its replacement with the world's first complete MIDI drum kits, the TBD and TBE Compact Drum Systems. These arrived complete with a sound-generating 'brain' and pads that could act as cymbals or hi-hats as well as kick drums, snares and tom-toms. Suddenly, a drummer could set up an electronic system, plug it in, and play a full kit without needing acoustic drums or metalwork to fill the gaps (see the box above). There were three families in the JV series and its direct descendent, the XP series. The low-cost instruments were all GS compatible, and there were eventually to be four of these, the JV30 (pictured below), JV35, JV50 and the XP10. Although the specifications improved as each model was superseded by the next, these were all limited to a single tone per patch, and they lacked the sonic depth of their more expensive siblings. They also lacked the slots for PCM Expansion Cards, data cards, and Expansion Boards, although the JV35 and JV50 (and, strangely, the JV90) let you install either the VEGS1 or VEJV1 board. As its name implies, the first of these was a GS sound card that added a further 28 voices of polyphony and a further 16 multitimbral parts. The second added 28 voices, eight multitimbral parts, and was in many ways a JV80 on a card. The second family was more powerful, and included the original JV80, its successor the JV90, the JV880 rackmount and, finally, the JV1000 workstation. These shared the JV80 sound engine, although it's worth noting that their internal ROMs changed as each model replaced the previous. All accepted 2MB PCM Expansion Cards and one 8MB Expansion Board, as well as commercially produced data (patch) cards that used the waves in the internal ROM and Expansion Cards as the basis of new sounds. The third family replaced the second in its entirety, and expanded hugely upon it. Polyphony was increased to 64 voices and, depending upon model, between one and eight Expansion Boards could be accommodated. Furthermore, the standard chorus/reverb effects structure was improved to include an EFX (expansion effect) that you could use in a primitive multitimbral way to add effects to some patches, but not others. The models in this family included the JV1080 (which was the only one to retain the earlier PCM Expansion Card and data card slots), the XP30, XP50, XP60, XP80, the JV2080 (which offered three EFX units) and the JV1010, which proved to be the final model in the JV range. At the time the JV80 was launched, there were just two of the 2MB PCM waveform cards available, Piano Selection and Guitar & Brass. Roland promised that others would soon become available, and a further six were added before the series was discontinued in 1996. The additional cards included drums, accordions, orchestral sounds, baroque instruments, and country/folk/bluegrass, with some of the sounds they produced remaining unique to this day. Shortly after the JV appeared, Roland started to produce the 8MB Expansion Boards that, for many years, formed the backbone of its synthesizers. 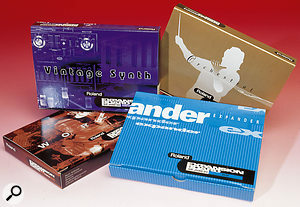 There were 21 of these, with the complete listing running as follows: The themed card-based SR JV sound expansion libraries (of which just a few of the earliest are shown here) were compatible with nearly all of Roland's sample-and-synthesis based products of the '90s, and were hugely successful. SR JV8004 : Vintage Synth. SR JV8007 : Super Sound Set. SR JV8008 : Keyboards of the 60s & 70s. SR JV8010 : Bass & Drums. SR JV8012 : Hip-Hop Collection. SR JV8013 : Vocal Collection. SR JV8014 : World Collection: Asia. SR JV8015 : Special FX Collection. SR JV8016 : Orchestral 2. SR JV8017 : Country Collection. SR JV8098 : Experience 2. Of these, SR JV8007 (Super Sound Set) is perhaps the most interesting, because it contains most of the waveforms and patches found in the 2MB Card series. However, for collectors, SR JV8098 (Experience 2) and SR JV8099 (Experience) boards are the most intriguing. These were bundled with some synths, and contained a selection of waves and patches from the other boards. Such was the popularity of the JV/XP sound sets that Roland released some of their sounds on CD-ROMs for their samplers, and later based a complete series of rackmount sound modules — the Sound Expansion Series — upon them. Most recently, many of these waveforms have reappeared on the SRX expansion board series for Roland's newer XV-series synths. By 1992, electronic drums had been available for more than a decade, but there had never been a complete MIDI drum system that you could assemble in the form of a conventional kit, play like a conventional kit, and which — when used appropriately — would sound similar to a conventional kit. Like their earlier electronic drums, Roland's Compact Drum Systems looked great, but the pads didn't play well enough to be considered attractive to drummers, and they were unsuccessful. Roland changed that when they launched the Compact Drum Systems. There was just one type of pad, the PD7, but this had dual sensors — on the pad and the rim — and you could configure as many of these as you wanted to provide the snares, toms, hi-hats and cymbals that you required. Meanwhile, kick-drum duties were fulfilled by the dedicated KD7 pedal/trigger units, and hi-hat control was provided by an FD7 pedal. The heart of the system was the TD7, a half-rack sound generator with hundreds of samples, 32 programmable kits, a built-in phrase sequencer, and nine stereo inputs for the trigger signals generated by the pads. With everything mounted on the dedicated MDS7 stand and the pads hooked into the TD7, you were ready to play. Unfortunately, the tactile response of the PD7 pads was not good enough for serious players, and after an initial surge of excitement, sales collapsed, and the outlook for electronic kits seemed bleak. Even the introduction of a range of pad sizes — the 7.5-inch PD7 was later supplemented by the 8.5-inch PD5 and 10-inch PD9 — failed to generate much interest. Eventually, some players opted to add one or more PD7s and a TD7 to their acoustic kits, allowing them to augment the sounds they obtained from conventional drums and percussion. Roland didn't really reap the rewards of their efforts until four years later, when they released a much improved set of drum products. SV50R & SV100DR 'Solid Valve' guitar amps. JD990 Super JD synth module. In contrast to the previous year, 1993 was quiet by Roland's standards, although a slew of new products continued to appear. There were more JV synths, more Boss effects, more amplifiers and mixers, more E-series accompaniment keyboards (the most expensive of which adopted the JV80 sound engine), and new digital pianos, rhythm products and sequencers. There were also the first of a range of processors that adopted elements of Roland's RSS (sound space) technology, and used this to generate effects that belied their modest price tags. But, 1993 should be remembered as the year in which Roland finally, finally released their first true synth workstation, the JV1000. First to appear, however, was the JV880, a rackmount version of the JV80 keyboard synth. This shared its predecessor's 28-voice polyphony, eight-part multitimbrality, dual effects, and its selection of PCM samples. Likewise, it also accepted a single SR JV80 Expansion Board, and had slots for a PCM Expansion Card and a Data card. 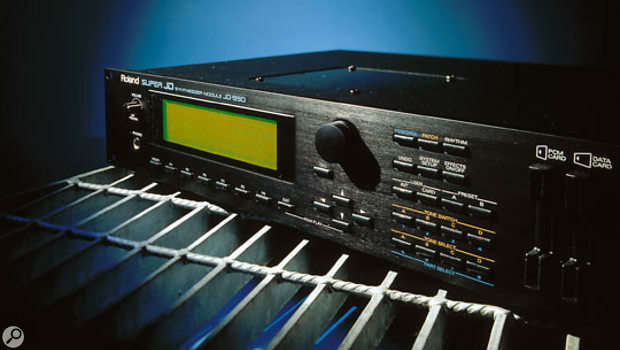 Replacing the U220, the JV880 became one of Roland's most successful products of the early '90s. 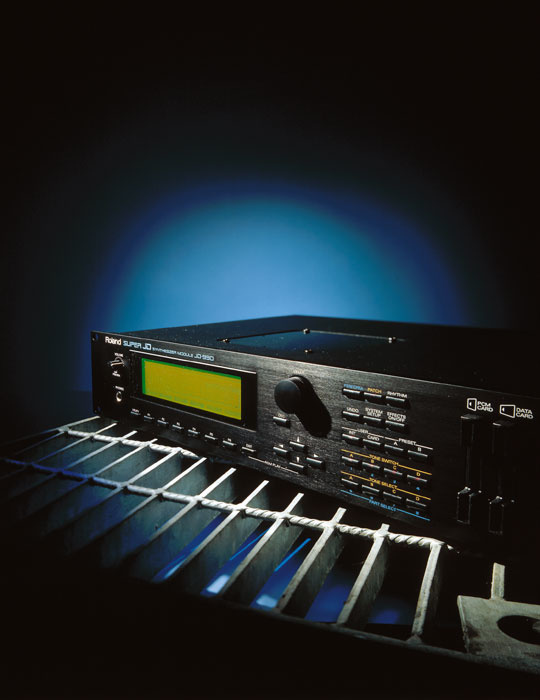 The JD990 was Roland's best sample-and-synthesis sound module ever in 1993, but Roland were on such a roll in the early '90s that it was surpassed just one year later by the JV1080. Even better, and still respected to this day, was the JD990. While similar to the 'JV' series, this was really an enhanced JD800 in a 2U rackmount, to the extent that you could program many of its parameters directly from the JD800's front panel. Sound-wise, it was a bit of a hybrid, being based on the JD800's ROM, but with almost double the number of waveforms courtesy of much of the JV80's innards. It also had the JV's ability to host a SR JV80 Expansion Board, Expansion Cards, and Data cards. There were many other enhancements. For example, the filters were not merely resonant but self-oscillated, the large LCD provided graphics that showed exactly what was happening to whatever you were editing, there was oscillator 'sync' and ring modulation, and there were Structures that let you combine Tones in different ways. There were also lots of real-time control options, and no fewer than eight outputs. There was even an attempt to add limited multitimbrality to the effects in a Performance. When it appeared, the JD990 was described by Roland as their 'best synth yet' and, for once, the claim was justified. Shortly after the JV880 and JD990, the JV1000 arrived. Its synth engine was another hybrid, with the standard 28-note 'JV' polyphony, but an enhanced set of waves including a better set of piano samples in its ROM, and far more patch and preset memory than the JV80. Of course, the JV1000 offered the now standard facility to install an 8MB Expansion Board, and offered slots for 2MB Expansion cards and Data cards. There was also space for a VEJV1 or VEGS1 board, either of which doubled the synth's polyphony to 56 voices, which was a respectable total in 1993. Furthermore, as I would discover a few years later, the JV1000 would also (with a few glitches) host the superb VERD1 piano board, even though Roland claimed that it was not designed to do so, and that it would not function. Nevertheless, the thing that made the JV1000 special was the inclusion of its 'Super MRC' sequencer; the first that Roland had installed in one of their top-of-the-range synthesizers. This offered all the power of the 'MC'-series sequencers, with eight tracks, each capable or recording and replaying all 16 MIDI channels, plus a dedicated rhythm track for pattern-based programming. What's more, it was compatible with Standard MIDI Files (SMF), so you could write sequences to, or play them from, all manner of other machines. The sequencer even had its own screen and a second MIDI output, so the JV1000 was capable of transmitting no fewer than 32 MIDI channels to the outside world. There were other goodies, too. For example, you could automate real-time parameters such as Level and Pan, and the big JV even included a synchroniser so that you could use it with other recording systems. 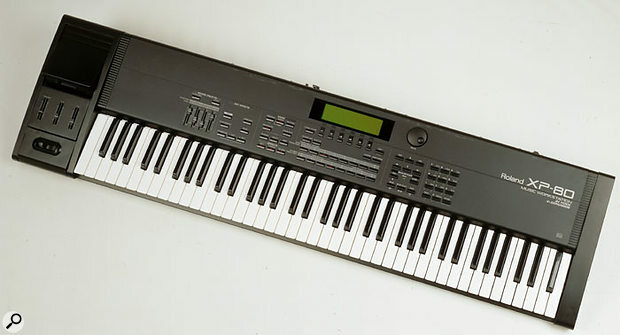 All this was hosted by a super-sleek instrument based on Roland's excellent velocity- and aftertouch-sensitive 76-note keyboard, which featured eight assignable edit sliders, and which offered numerous master keyboard functions, Yet, despite its length, the JV1000 was surprisingly light and portable; indeed, an ideal 'live' instrument. If there was a limitation, it lay with the 3.5-inch floppy disk drive, which served only the sequencer. This meant that, to save patches and performances, you had to record the data first as a SysEx file, and then write this to floppy disk. Actually, there was a second limitation... rather than adopting the more powerful effects section introduced on the JD990, the JV1000 retained the JV80's limited chorus/reverb effects structure. But these were minor niggles. It was fair to say that — five years after their competitors — Roland had finally arrived in the workstation marketplace. The first Roland Atelier organ, the AT70.Roland founder Ikutaro Kakehashi admits that he views the organ as the "most complete musical instrument". 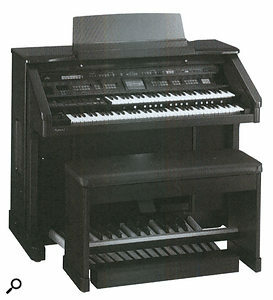 Despite this, or maybe because of it, the first of Roland's home organs, the Atelier AT70, was a strange hybrid of ideas. For example, its lower manual was 76-notes wide, was velocity-sensitive, and responded to a piano-style damper pedal. 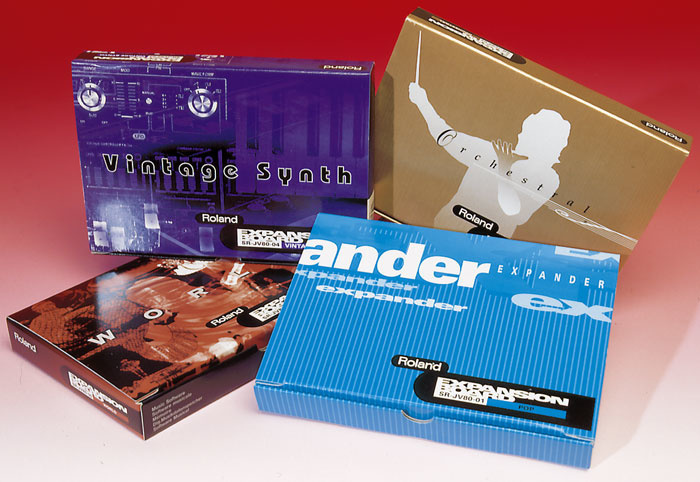 Unlike traditional organs, the Atelier also offered many of the rhythm and accompaniment features found on Roland's E-series accompaniment keyboards, and it even accepted Roland's existing Style cards. In addition, it included a 40,000-note sequencer. However, it didn't incorporate some expected organ facilities such as drawbars, and its sound-editing capabilities were decidedly limited. Nonetheless, there was no mistaking that the complete package was a large home organ, and it certainly packed a punch: a 240W punch, to be precise. The AT70 (which cost a hair under £10,000) and its more affordable little brother the AT50 may not have been the most successful of Roland's instruments, but they were to spawn a dynasty that would become highly respected in its field. The initial range was fleshed out by the AT30 and the huge AT90 in 1996, and then the AT80 in 1997. There were no fewer than four new models in 1999 (the AT20R, AT60R, AT80R, and AT90R) followed by the introduction of the current range two years later. There are now seven of these: the AT10S, AT20S, AT60S, AT80S and the mighty 256-voice AT90S models that appeared in 2001; plus the AT15 and the baby of the range, the single-manual AT5 launched the following year. DA400 D-A converter for S760. OP760 1 option board for S760. JV1080 Super JV sound module. RAP10 PC soundcard & ATW10 PC software. I think that it was in 1994 or thereabouts that some people started to feel that Roland were no longer at the forefront of synthesizer design and manufacture. They were right... although the company were making very popular, commercially successful synths, they had begun to recycle ideas. 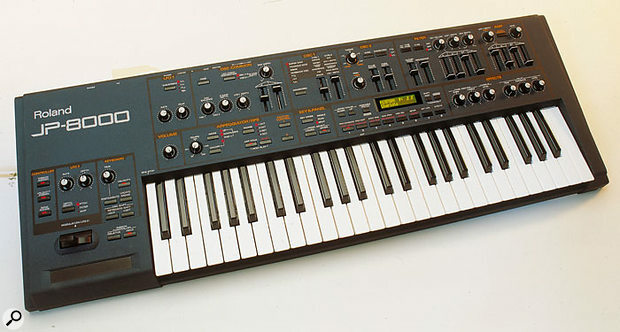 Each year, although the specifications of their sample-and-synthesis synths improved, with more sounds, higher polyphony, more effects, and so on, the underlying technology and synth engines remained very similar (and have done so for all the company's S&S synths until the present day). Roland were hardly alone in this — similar developments had occurred at Yamaha by 1994, and would occur at Korg a year later, so you could argue that all three arrived at well-rounded implementations of S&S synthesis that didn't require fundamental changes. But this did mean that there was less to distinguish the sample-based synths that Roland produced as time went on. Consider the three keyboard synths launched in 1994. None of them was bad, but none of them was groundbreaking or exciting, either. The JV35 was merely a GS synth that replaced the JV30. Sure, it had more memory, and was able to host a VEJV1 or VEGS1 board, but it offered nothing new. Likewise, the JV50 was merely a JV35 with a sequence player. Then there was the JV90, a 76-note version of the JV80 with more memories and a larger ROM. This astonishingly light synth was an excellent gigging keyboard, but it lagged behind the instruments being produced by other manufacturers. Yet another repackaging job, the Rodgers W30 was a curious beast; it was a JV50 with an expansion board dedicated primarily to classical organ sounds. Aimed at small churches, chapels and perhaps even evangelical meetings, it certainly sounded different from the other 'JV' synths and, in retrospect, it's a shame that Roland did not pursue the idea of voicing and branding instruments for specific purposes. Roland got the multitimbral rackmount synth concept just right with the JV1080, and sold them by the lorryload. Much more successful was the module that replaced the JV880, the so-called 'Super JV', the JV1080. This improved hugely on Roland's existing PCM-based synthesizers, with an internal wave memory of 448 waveforms rather than a hundred and something, as found in all previous JVs and JDs. It was also the first Roland synth with a JV name that incorporated the advantages of the JD engine, including multiple Tone structures and ring modulators. In addition, it introduced a new 'Boost' facility that generated overdrive, clipping, and distortion for a range of more aggressive timbres than would normally be associated with Roland's digital synths. With 40 'insert' effects, 64-voice polyphony, six outputs, and space for no fewer than four Expansion Boards, it instantly rendered every previous Roland 'samploid' synth engine obsolete. S760 sampler. The S760 sampler was yet another new kid on the same block, updating the S770 engine with more RAM, an improved editing system, and the ability to read Akai S1000 samples (although only over SCSI, not directly from floppy disks). The S760 was much more affordable than its predecessors, but it accomplished this in part by dispensing with the digital I/O, the CRT interface, and the mouse input. Fortunately, these were available on an optional expansion board, the OP760 1. Together with the optional DA400 D-A converter, the S760 and OP760 1 combination was Roland's best sampler to date. 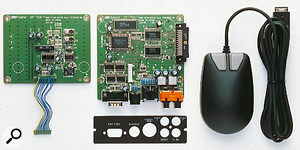 The OP760 1 video-output board and optional mouse for the S760 sampler. Elsewhere, there were numerous improvements and extensions of other existing technologies. 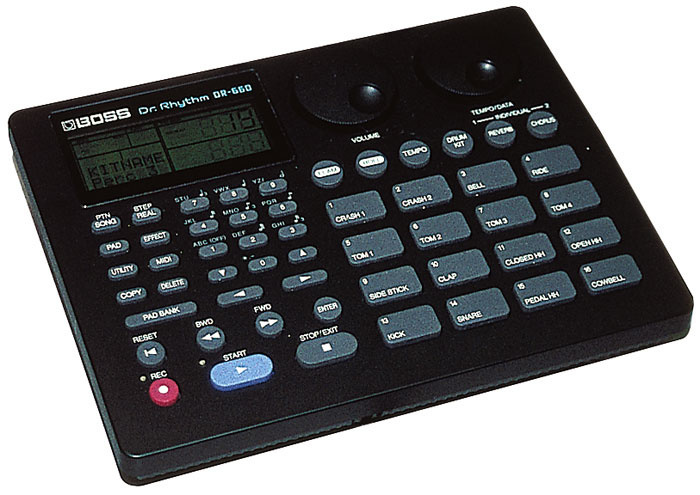 These included the SDX330, which was another in the 'S' series of effects units that used RSS technology, more guitar products, another E-series keyboard, more Sound Canvases, more pads for the Compact Drum System... basically, just more, more, and more. So where was the hot news of 1994? As it turned out, there were some significant developments and changes afoot, but not where you might have expected them. By 1994, domestic 'console' organs were becoming an endangered species; either replaced by accompaniment keyboards, or simply consigned to Granny's back room. But in the view of Roland founder Ikutaro Kakehashi, the home organ market had been shrinking not because people were less enthusiastic about playing this type of instrument, but because manufacturers had been failing to deliver what customers wanted. So, at that year's Frankfurt Musikmesse, Kakehashi achieved another of his dreams when Roland presented the first of its large, Atelier organs (see the box above). However, he didn't do so unaided, having gathered to the Roland fold many experts in the field. For example, Carlo Lucarelli — once the Technical Manager of Farfisa, and later one of the founders of SIEL — became the President of Roland Europe following Roland's acquisition of his company. Likewise, Dennis Houlihan, now President of Roland US, was once Vice-president of Marketing at Lowrey. Then there was Alberto Kniepkamp, a former Director of R&D at Lowrey, who became the head of Roland R&D in Chicago in the late 1980s. It's hardly surprising that, when Roland entered the organ market, they did so at the top, and far from tentatively. The year also witnessed the launch of the company's Video Canvas Desktop Video System, although this was only released in Japan. A precursor to today's PC-based video editing systems, this was a subtle, but in retrospect important pointer toward Roland's view of the future of music technology and hi-tech. Perhaps the most fundamental of these was a new method for conceiving, designing and manufacturing new products. Called the 'Producer' system, this required that the planning and design stages for each new product were carried out by just one team under the management of a single team-leader (or 'Producer'). The team acted almost as a separate company within Roland, but with access to the Group's corporate facilities. Then, when the planning stages were complete, a new team was chosen from within the Group's manufacturing base, and the product moved into production. To complement this, Roland adopted an ambitious development strategy called the '301 Project'. At the time, the company said of this project, "its goals are to develop the number one product in each category with a 30-percent increase in value compared to previous models". Today, Roland claim that the project has been very successful, and that products such as the XP80, VS1680, and V-Drum systems (of which more later in this article) exist as a consequence of adopting '301'. But not all the changes were designed to increase revenue. In 1994, Kakehashi established the Roland Foundation, with the intention of bringing music to people worldwide. The Foundation opened music schools, and funded competitions and concerts in all musical genres. One of the earliest examples of the Foundation's work was the exchange of three Japanese pieces of music and three Spanish pieces of music, all in Standard MIDI Format, between schools in Japan and Spain. These were then arranged by the other countries' students and returned to their original country for review and comments. The aim was not just to encourage musical creativity, but also to promote understanding of two cultures using music as the medium. More recently, in April 2004, the Foundation became Japan's Secretariat of the Associated Board of the Royal Schools of Music, the British organisation that provides the standard framework for music grading and examination the world over. GP100 digital guitar preamp & FC200 MIDI foot controller. MDC1 dance sound module (Sound Expansion series). MGS64 GS/GM sound module (Sound Expansion series). MOC1 orchestral sound module (Sound Expansion series). MSE1 strings sound module (Sound Expansion series). MVS1 vintage keyboard sound module (Sound Expansion series). By the mid-'90s, it was impossible to think of Roland as merely a synthesizer company. In truth, they never had been this alone; products such as the JC series of guitar amplifiers had long demonstrated their commitment to other types of customer. Indeed, you could say that by 1995 Roland no longer had a single main market, and that they were just as committed to small studio owners, pianists and organists as they were to rock & roll musicians. Perhaps it was for this reason that the year's offerings in its original fields of endeavour were so unremarkable. Firstly, there was the further evolution of the 'JV' series of synths and workstations into the 'XP' series. At first, there were just two of these. The XP10 replaced the short-lived JV35, adding extra memory and an arpeggiator, but retaining the GS/GM sound engine. More interesting was the XP50, which was in many ways a JV1080 with a 61-note keyboard and a sequencer. However, the XP50 lost the PCM card and Data card slots that had existed since the JD800 had appeared in 1991. It also lost two of its pairs of stereo outputs, which made it less suitable for studio use. There was also the introduction of the 'Sound Expansion Series' modules which were, in truth, little more than SR JV80 expansion boards in 1U rackmount boxes. Initially, the series comprised five units, all of them designed primarily for use as preset systems, although the JV1080's SysEx commands were supported, so you could edit them using appropriate software if you wished. However, there were no onboard memories in which to store your results. There was also an addition to the E-series range, and two new Arranger modules, the more expensive of which (the RA95) was in effect an E86 in a box. Roland even produced a two-octave Acoustic Piano Pickup, which detected key movements and sent the information to any of the E and RA series for conversion into backing tracks. More interesting, perhaps, was the G800, which was Roland's entry into the top end of the home keyboard market. Like the E series that continued alongside it, the GS/GM-compatible G800 was an 'Intelligent Synthesizer', but it sported a 76-note keyboard, a large LCD, and more styles. Unfortunately, it lacked a sequencer, and there was little scope to edit sounds. The same could also be said of the DM800 which, despite being seeming very appealing, ultimately failed to impress. This long, slim box was perhaps the first fully self-contained DAW, needing neither a computer in tow, nor a bank of external rackmount processors, nor even external hard disk drives if you installed the optional internal drives that it supported. What's more, it offered real-time two-band EQ, time compression, pitch correction, and even mix automation. Add to this outputs for external video monitors to augment the onboard graphic LCD, a proprietary expansion buss, dual SCSI ports, a slate of MTC and LTC synchronisation options, project management and backup to DAT or MO drives, and everything looked pretty hunky-dory. But the DM800 was not a success. Perhaps this was because each SCSI port was limited to just four channels of recording/playback, or because the digital I/O was limited to S/PDIF rather than the more professional AES-EBU interface. Perhaps it was because of the limited fade and crossfading facilities, or more likely it was because editing was clunky, and the waveform display was of low resolution and difficult to use. Whatever the reason, the DM800 promised much, but survived just a handful of months before Roland announced a product that would sweep it away at a stroke. So, where was the big news in 1995? In retrospect, there was one overriding development that year, and it would soon have an impact on all manner of Roland products. It wasn't a keyboard, a synth, a sound module, or an effects unit; it was a digital signal processing technology that Roland called Composite Object Sound Modelling. COSM was a method of combining the physical modelling of various elements in the sound generation chain, and reducing the results to a single algorithm. It first appeared in the GP100, which offered emulations of Marshalls, Fenders and of course Roland's own JC-series amplifiers, and was perhaps the world's first physically modelled guitar preamp but, much more notably, it was also the basis of the VG8 Virtual Guitar system (see the box on the left). Inevitably, the VG8 didn't quite live up to its promise, and Roland were to improve the V-Guitar system on numerous occasions over the next few years. The VG8 would be superseded by the VG8EX in 1998, followed by the VG88 in 2000, the VGA series of modelled guitar amplifiers in 2001, and the V-Bass in 2002. Likewise, the GP100 would soon make way for the GX700, and then the floodgates would open, as COSM infiltrated many of Roland's product ranges. Indeed, the company now incorporate COSM technology in almost every synth, organ and multi-effects unit that they produce. Even if it was in some respects one of the company's less eventful years, at least one thing must have put a smile on the face of Roland's shareholders and bankers in 1995 — this was the year in which the company sold their millionth GS sound module. Given that the format only appeared in 1991, this was no mean achievement. The VG8, core of the V-Guitar system, the first of Roland's commercially released (and highly successful) 'V' products (the V-Piano, supposedly the first mooted 'V' product, remains unrealised at the time of writing...). The VG8 confused many when they first saw it. Was it an effects unit? Not exactly. Was it a guitar synth? Well, not exactly. Was it a preamp? Yes and no. In fact, the VG8 proved to be the precursor of what has since become a common element in our musical armoury: the physically modelled guitar amplifier, speaker cabinet and recording environment. With the GK2A pickup mounted on your existing electric guitar, the Virtual Guitar Modelling (VGM) system in the VG8 allowed you to decide whether the resulting sound would be that of a single-coil or humbucking pickup, and where that lay on the body or neck. You could then choose which kind of amplifier the system would model, and whether the output was reproduced through a virtual 1x12, 2x12, 4x12, or a stack. Finally, you could choose whether or not the sound was DI'd, or recorded using one of selection of 'virtual microphones' positioned at user-defined distances and angles from the virtual speaker cab. COSM provided a fair degree of control over all of this, allowing you to obtain a good range of rock timbres using standard pre-amp and amplifier controls, as well as Boss-style dynamics processing, overdrive, and effects. The factory programs tended to concentrate on the mainstream nature of the sounds thus produced, with patches named Jimi Hendrix this and Jeff Beck that, but the VG8 also offered the hex-distortion that made the GR300 so distinctive, so it was able to produce another wide family of sounds not obtainable from conventional guitar, amp, and speaker setups. In addition to all the above, the VG8 included a second form of DSP processing called Harmonic Restructure Modelling, or HRM. This was surrounded by quasi-scientific marketing gobbledygook but, in essence, it was a means of processing the string vibration in different ways to produce new harmonic structures. Roland pointed out that, because the actual string vibration was the sound source, the results were far more expressive and organic than using the guitar to trigger synthesized sounds. This may have been true, but few players made full use of the brass, bowed strings, lead synths, bass, pads, organs and all manner of weird sound effects models that HRM offered. VS880 digital multitrack & VS8F1 effects board. VG8S1 system expansion for VG8. A90EX (plus VERD1 piano expansion board). The VG8 marked the end of a fallow period for Roland that had lasted from 1993 to 1995, and the next two years were to see an explosion of advances, many of which were fuelled by the magic letter 'V'. Of these, the first and one of the most significant was the V-Studio, more commonly known as the VS880. 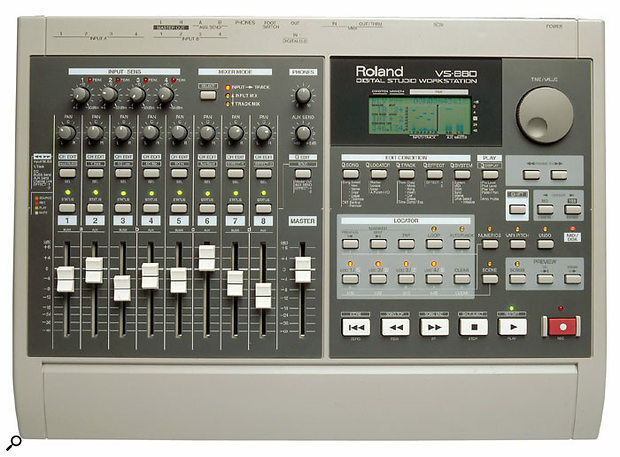 Announced in 1995, and immediately nicknamed 'the digital portastudio' (although not by Tascam, who had registered Portastudio as their trademark), the VS880 brought digital recording, mixing and multi-effects together in an affordable, self-contained package that was portable enough to carry around in a carrier bag (see the box below). With a built-in MC-style sequencer, JV1080 synth engine (including effects) and 76-note keyboard, the XP80 was a fine successor to the JV1000 workstation. Elsewhere, the evolution of JVs into XPs was continuing apace as the JV1000 was replaced by the XP80 workstation. This shared the big JV's 76-note semi-weighted keyboard, but it was far more than simply a wider XP50. It offered a much larger LCD that could display extensive graphics as well as menus, and there were more real-time controls, twice as many outputs, inputs for twice as many controller pedals, a more powerful sequencer, and a new arpeggiator. With its four expansion slots, the XP80 was the closest thing to a JV1080 with a keyboard and, as such, it justified its continued status as a powerful and popular workstation. Roland also expanded their range of Atelier home organs with the AT30 and the new head of the range, the AT90. This offered the oversize manuals of its predecessor, provided similar auto-accompaniment facilities, stuck with the GS/GM sound source, and again blasted 240W through no fewer than 11 speakers! But there were many extra features, and although there's no room to discuss them here, one bears special mention. It's the price: a mere £19,999. It's clear that, when Kakehashi entered this market, he wasn't messing around. Perhaps the best keyboard launched in 1996 was the replacement for the A80 controller keyboard. The A90 looked fantastic, and its superb 88-note piano action simply begged you to play. In addition, it had many unexpected and sophisticated functions under its large, clear controls and, with the VEGS1 or VEJV1 board installed, it became a powerful GS/GM or JV sound source in its own right, with limited but nonetheless useful editing capabilities. Nevertheless, the jewel in the A-series crown was the A90EX, a standard A90 with the VERD1 board pre-installed. This contained what remains for some players the finest digital piano yet developed, complemented by numerous electric pianos, D50 and JV-style sounds, all editable to a degree, enhanced with EQ, chorus and reverb, and reproduced with generous 64-note polyphony. 1996's A90, one of Roland's finest controller keyboards. The A90 was large, heavy, beautifully built and expensive, but I suspect that 1996 will be best remembered for a product at the opposite end of the spectrum. Small, light, and relatively cheap, it was something that Roland had spent more than a decade claiming that it would never produce. It was the successor to the chosen tools of the techno brigade, the TB303, the TR808 and the TR909. It was the MC303, which, depending upon your perspective, either helped to hurry the destruction of popular music, or was a wonderful, liberating box that brought Groove to the masses. The MC303 comprised two major sections: a synthesizer that included numerous rhythm sets, and a sequencer. The former was 28-voice polyphonic, and many of its sounds were culled from the TB303 and various TRs. There were complete sound banks devoted to synth bass, as well as whole banks of individual percussion sounds such as kick drums, snares, handclaps and so on. However, there were also numerous pianos, organs, brass patches, and guitars. Consequently, you could use the MC303 to create far more than just drum & bass. The sequencer offered just eight tracks and a capacity of 14,000 notes, but it was far more flexible than it seemed, with phrase sequencing, an arpeggiator, several quantising functions, a few hundred preset patterns and their variations, and space for a further 50 patterns of your own. Roland said they'd never re-introduce the TB303, as it was too expensive to mass-produce its all-analogue design in the mid-'90s — but eventually they did concede and produce a digital version, the MC303, to great success. 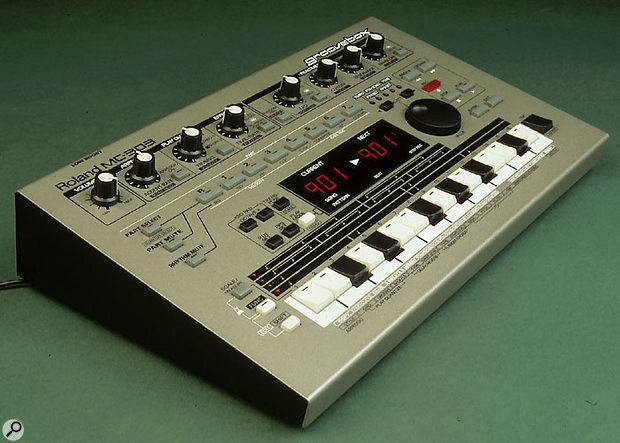 Roland had inadvertently helped to invent house, acid, trance, techno, and most other forms of '90s dance music, so it came as no surprise to find that the MC303 was an instant success. Analogue purists tried to claim that it sounded nothing like the real thing, but played through a 10,000W PA system producing little sound energy above 150Hz, it's doubtful that anybody could really tell the difference. So, despite a few anoraks moaning about how things weren't as good as they were in the good ol' days, the MC303 simultaneously defined the nature of the Groovebox and re-defined the way in which many people produced dance music. 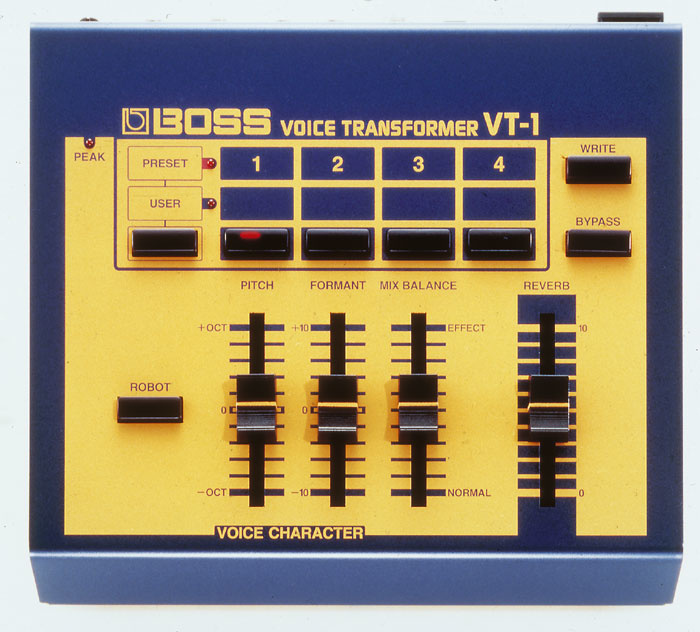 Boss's VT1 was one of the first affordable formant-based vocal processors, allowing you to transform male into female-sounding vocals and vice versa, as well as offering many vocal special effects. A few other developments from 1996 deserve a quick mention. 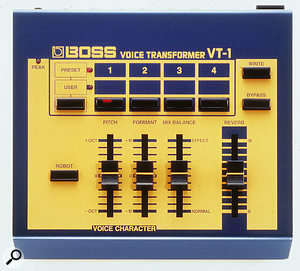 One was the Boss VT1 Voice Transformer, which soon popped up in all manner of Roland products, and provided endless hours of fun, turning men into women, women into children, children into robots, and robots into Bugs Bunny. Then there was the LVC1 Lyrics Video Converter, which read the lyrics that could be stored within the SMF data format, and displayed them on a video monitor. Compatible with the G800, RA800, the KR570 and KR770 'Intelligent' pianos, plus the E68 and E96, this allowed you to turn your expensive keyboard into a karaoke machine. No doubt it was big in Japan! Finally, just to prove that Roland don't always think of the good ideas first, there was the PMA5 Personal Music Assistant. This hybrid of a Palm Pilot, a sequencer and a GS/GM sound source was a great little product that would have been worthy of far more than a mere mention... had Yamaha not done something rather similar five years before. There were a couple more important snippets of news in 1996. Firstly, after the failed attempt to relaunch Rhodes pianos and keyboards in digital form, it appears that Roland transferred the brand name back to Harold Rhodes, who said that he hoped to restart production of electro-mechanical pianos. Unfortunately, Rhodes was an elderly man, and died just four years later, aged 89, without realising that dream. Secondly, there was the appointment of Mr Katsuyoshi Dan as President of Roland Corporation. Ikutaro Kakehashi was to stay on as Chairman of the Group and of the Roland Foundation, but his health had declined and, after 24 years, Dan's appointment signalled a lessening of Kakehashi's involvement in the day-to-day running of the company. It wasn't the first compact digital multitracker, but it was the first really good one, combining random-access digital recording, advanced COSM effects, and digital mixing facilities in one sub-£1500 product. 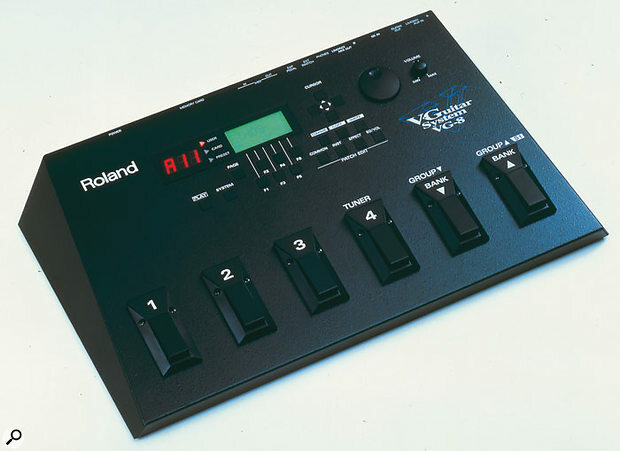 A handful of Roland employees first saw the VS880 in 1994, when it appeared as a Styrofoam dummy called the VR88. Of course, the development was highly confidential because, had it leaked out, it would have killed sales of the existing DM80 and the DM800 that was due to be launched the following year. But when the VS880 finally appeared in 1997, nothing in it was new. We had all seen eight-track hard disk recording before, as well as digital mixing, automation, and digital effects. We had also been introduced to Roland's Sound Space processing (RSS) and COSM, so the optional VS8F1 dual effects board did not cross any boundaries either. Nonetheless, the VS880 and VS8F1 combined all these elements in a new way that was both affordable and simple to use. With a 540MB drive installed, the VS880 offered around 100 minutes of audio at 44.1kHz, but for applications where recording time was more important than audio quality, three data-compressed recording formats were offered. Not so critical in today's world of Terabyte drives, this was a significant consideration when external 1GB drives were not only state-of-the-art, but seriously expensive. The VS880 could only record six tracks at a time, but each of its eight tracks could up to hold eight 'Takes'. A limited form of snapshot automation was provided within the VS880 itself, but by connecting it to an external MIDI sequencer, you could enjoy dynamic automation of many parameters. The VS880 fell short in two areas. Firstly, its editing model (unassisted by a waveform display) was even less capable than that of the DM800. Secondly, there was its inability to replay all eight tracks when using the uncompressed audio mode. In this case, just four tracks were available. But as the healthy sales attested, many people were happy to live with these restrictions, perhaps because the VS880 was the cheapest way to obtain all of these features in one package. And though it lasted just a year before being superseded, it was a seminal product for Roland. GC405/GC408/GC405X & GC408X guitar amps. SST151 & SST251 speaker systems. VS880 V-Xpanded digital studio workstation. VK7 'Virtual Tonewheel' combo organ. EP75 & EP85 digital pianos. HP130 & HP730 digital pianos. TD10 V-Drums percussion sound module. It was Roland's 25th birthday in 1997, and whether through coincidence or otherwise, it was to prove to be a bumper year for the company. Despite Kakehashi's departure from the hot-seat, Roland continued to establish new companies and joint ventures worldwide, adding Roland France SA and the Roland Taiwan Enterprise Company Ltd. (which is distinct from the manufacturer, Roland Taiwan Electronic Music Corporation) to the roster. Back in Japan, a new factory in Miyakoda was opened, primarily to build larger products such as Atelier organs. Roland were very proud of this plant, declaring that production was carried out using a 'cell' system in which each worker assembled a single unit from start to finish. Given that the rest of the world embraces the production line (in which each worker is responsible for a single element of all units, rather than all the elements of one unit) this is very strange — Henry Ford would have been dumbfounded. This was also the year in which Roland applied the letter 'V' to three more areas of music technology, with their first modelled organ, a virtual analogue synth, and most important of all, the 'V-Drums' (see the box below). 1997's VK7 was Roland's best tonewheel organ emulation to date. Given Kakehashi's major contributions to the development of electronic organs in the 1960s, it's remarkable that Roland's efforts in this field had never lived up to their heritage. The company sold few VK6s and VK9s (1977), and the later VK1 (1979) and VK09 (1981) were horrid affairs. Released in 1990, the sample-based Rhodes VK1000 was a much finer instrument but, by 1997, numerous companies had produced better variations on a theme by Hammond, who had themselves developed the XB2 and XK1 keyboards, plus the XM1 module. Consequently, it was pleasing to discover that the VK7 'virtual tonewheel' was superior to these, chunky and robust, with a sound that was — thanks to its COSM overdrive, amplifier, and rotary speaker effects — even closer to that of a vintage Hammond. Unfortunately, the VK7 was let down by a handful of minor niggles. The year also saw the pinnacle of the development of the 'JV' series. 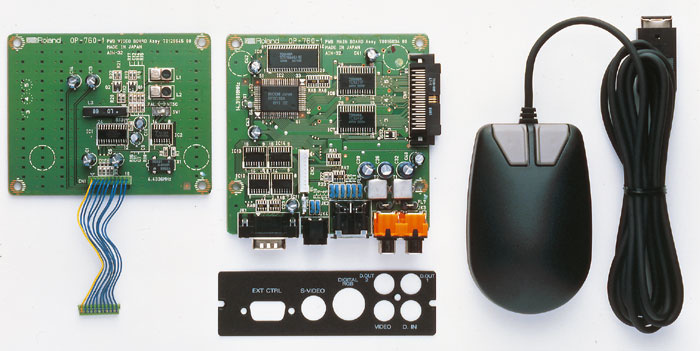 The JV2080 was a better, more powerful JV1080 that employed the XP80's large LCD, provided three EFX units, and was capable of hosting no fewer than eight expansion boards. With more patches and performances, and an improved operating system, the only deficiency with respect to the earlier model was the loss of the PCM card slot. But this was an insignificant loss, and the JV2080 immediately became Roland's 'pro' module, one that remains highly desirable to this day. Together with the earlier JV1080, the JV2080 was the bread-and-butter synth module of the '90s, and can be heard on thousands of records. Powerful though the JV2080 was, it was overshadowed by the launch of Roland's first 'physically modelled analogue' synthesizer, the JP8000. And, as had happened when the company announced the JD800, the rumours began. It had a 'J' in the name, and an '8'... was this the long-awaited digital Jupiter 8? Certainly, its knobs and sliders were in the grand tradition of big analogue polysynths and, in many ways, the JP8000 looked and felt vintage. Seven analogue-style waves lay at its heart, and these included the first appearance of the Super Saw waveform that has since become a standard ingredient in virtual-analogue synthesis. Like the Jupiter 8, the JP8000 offered 12dB- and 24dB-per-octave filters, and like the Jupiter 6, these were multi-mode affairs, with low-pass, band-pass and high-pass options. Other nods to the past included an effects section with chorus and delay (but no reverb), and an arpeggiator. There was also 'Motion Control', which was a grand name for recording front-panel adjustments as miniature eight-bar control sequences that could then be replayed as loops, or output to an external sequencer. Inevitably, not all was rosy, and the JP8000 had its deficiencies. Foremost among these was the unfathomable decision — and, in my view, serious mistake — to limit it to a four-octave keyboard. Secondly, it could sound a bit thin when compared to the Nord Lead and other modelled analogue synths of the day and, thirdly, its duo-timbrality and eight-voice polyphony were already way behind the times. Nonetheless, the JP8000 carved a niche for itself, and many remain in use today, not because they are the most powerful tools for the job, but because — like some classic synths — players simply like their sound. The JP8000 wasn't quite the 'Digital Jupiter' the synth fraternity had been waiting for, but it was a sufficiently impressive physical modelling synth that many of them remain in use today, eight years on. Elsewhere, Roland were continuing their habit of recycling existing technology in new ways. A sixth 'Sound Expansion' module, the MBD1 was a rackmount version of the SR JV10 Drum & Bass Expansion Board, while the RD600 stage piano (a superb instrument, by the way) was a hybrid of an RD500 piano, the A90's VERD1 board, and a selection of sounds from the SR JV80 expansion board series. As always, there were numerous new Boss pedals, numerous guitar amplifiers and effect units, another guitar synth, another Atelier organ, another Sound Canvas, another master keyboard, a significant redesign of the E-series keyboards to create the E300 and E500, and... well, you get the idea. There was even an upgrade to the previous year's VS880, which became the VS880 V-Xpanded. This was the same hardware with improved software, so existing owners could upgrade the VS880 to the later specification with the VS880 S1 System Expansion Kit. This included the new software, new manuals, and stickers to annotate the new functions on the front panel. The improvements were not trivial. Most notably, you could now replay six tracks in the uncompressed audio mode, and there were 10 new effects, including the Boss Voice Transformer algorithm, a COSM-generated Mic Simulator, and a Vocoder. To further improve the usefulness of these — and the previously included effects — Roland added new Insert options, as well as on-board automation and improvements to the editing capabilities. With a host of other improvements, the VS880 V-Xpanded was a much better buy than the original VS880, so the V-Studios deserved their continuing success. Drummers had failed to warm to Roland's electronic drums since the late '80s, but with 1997's V-Drums, the first COSM-based drum system, Roland finally cracked the market. 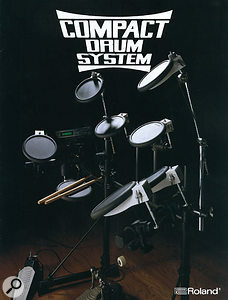 The V-Drums have been revised a couple of times since, and remain some of the company's most successful current products.Throughout the mid-1990s, Roland's 'Compact Drum Systems' had proved to be a disappointment, both to drummers and to Roland, with sales far lower than anticipated. 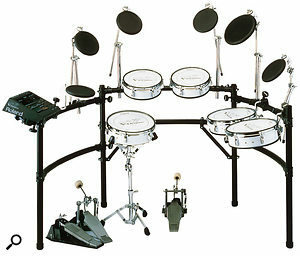 However, Ikutaro Kakehashi remained committed to manufacturing instruments in all the main musical groups and, recognising that the problem lay not in the sound generated by the kits, but the way that they responded to the drummer's technique, he never gave up on the idea of producing an electronic kit that both sounded and felt like an acoustic kit. After years of experimentation, Roland's engineers developed a drum pad based on what the company called a 'mesh drumhead'. This special fabric could be tensioned in the usual fashion, and therefore adjusted to suit each player's taste. Most importantly, it responded in a way that was much closer to that of a genuine drum skin. Unfortunately, Roland did not know how to manufacture these heads in quantity, so Kakehashi turned to Remo Belli, the head of Remo, the world-renowned manufacturer of acoustic drums and percussion. Remo's expertise was crucial to solving Roland's problems, and soon a new generation of electronic drum pads were born: the 10-inch diameter PD100 and the 12-inch diameter PD120. To complement the new heads, Roland introduced the 'V-Drum' brain, the TD10. Another product based on COSM, almost overnight this made all previous electronic drum sources obsolete. The TD10 provided a huge selection of drums (more than 600 of them) with detailed editing and fine-tuning of the bass, snare and tom-tom sounds, plus a wide selection of accompaniment sounds, extensive effects, and sequencing — but it wasn't the specification that made the V-Drums special. It was simply that the TD10 and a selection of PD100 and PD120 pads formed the basis of the most expressive electronic kit ever created at that point, one which provided the feel, controllability and expression that professionals demanded. With a couple of KD7 kick drum units, a FD7 hi-hat controller, plus a bunch of the earlier PD5, PD7 and PD9 pads for cymbals and other metalwork... the fully electronic drum kit had finally arrived! At the start of the '90s, Roland were emerging from a golden age in which it seemed that they could do little wrong. Then a recession hit... and whether this simply reflected the worldwide economic slowdown or pointed to a malaise in the music industry itself, the result was the same: sales in the company's traditional markets plummeted.